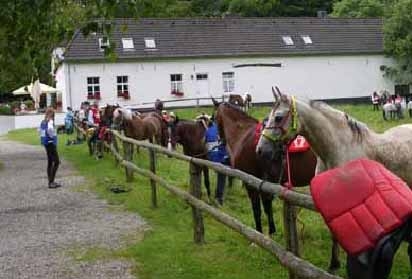 At 9.00 am next day the participants got their horses in trucks and trailors to bring them to the official starting place on the other side of town in “Aachen forest”. 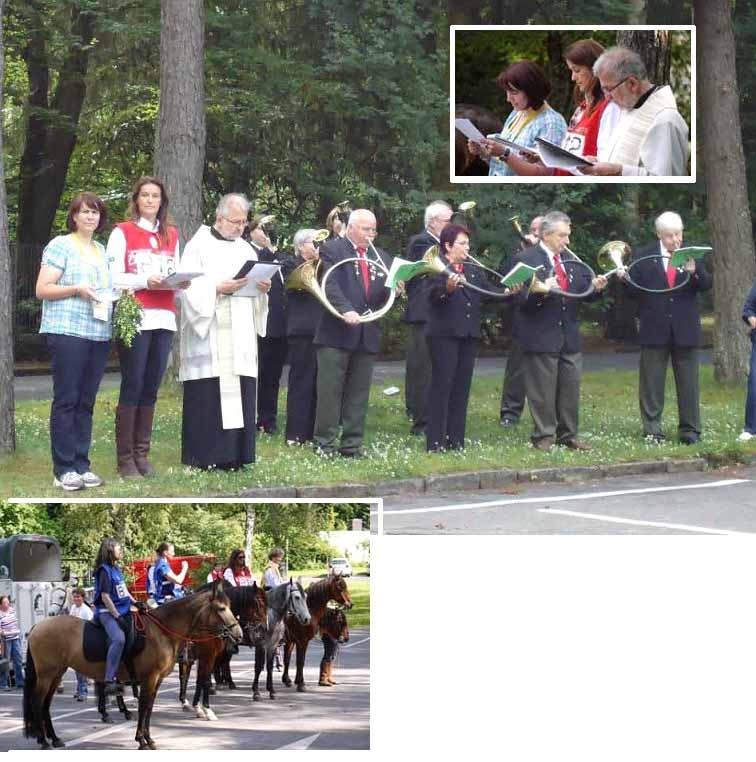 After harnessing and prepa- ring the horses all participants gathered with their horses around the preach who held a holy service reminding us of the responsibility of human mankind to take good care of the Lord’s creation and all animals and plants as well. After the holy service he blessed all the horses. This was accompanied by ten parforce musicians with their horns. Then the first group started at 10.30 am and every 10 minutes another group. We were very proud that we had 8 participants from Brasil: Sophia and Marcelo Baptista de Oliveira with their horses Trilho de Maripá and Patek de Maripá, Ricardo Barcelar Wuerkert with Sophia’s horse Urano de Maripá, Rogério Bivar Simonetti with the stallion “Espinho” sold to Robert Schmitt, Fernando Cardoso da Fonte and Silvio Amorim Fontes with horses from Kreiswald and the judge Tiago de Resende Garcia who started on an icelandic horse from Kreiswald to proof all the Mangalarga Marcha- dores during the ride and make his notes. 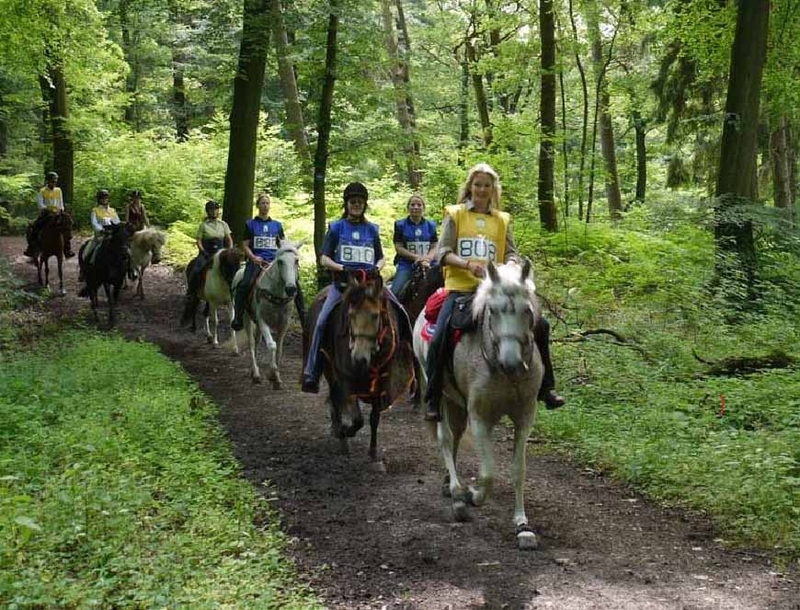 The ride went through the marvelous forest of Aachen’s surroundings. It was a beautiful track with a lunch break after 2 hours’ ride at “Gut Entenpfuhl”. Riders and horses got a rest of approx. 1 hour having preordered lunch and grass and water for the horses. The mood was fantastic and the whole event showed the friendship and emotional atmosphere amongst the participants! After another 2 hours ride the participants returned group by group at the final destination (which was the place of the start) and the vet check showed that all the horses were in excel- lent condition. No disqualification!!!! 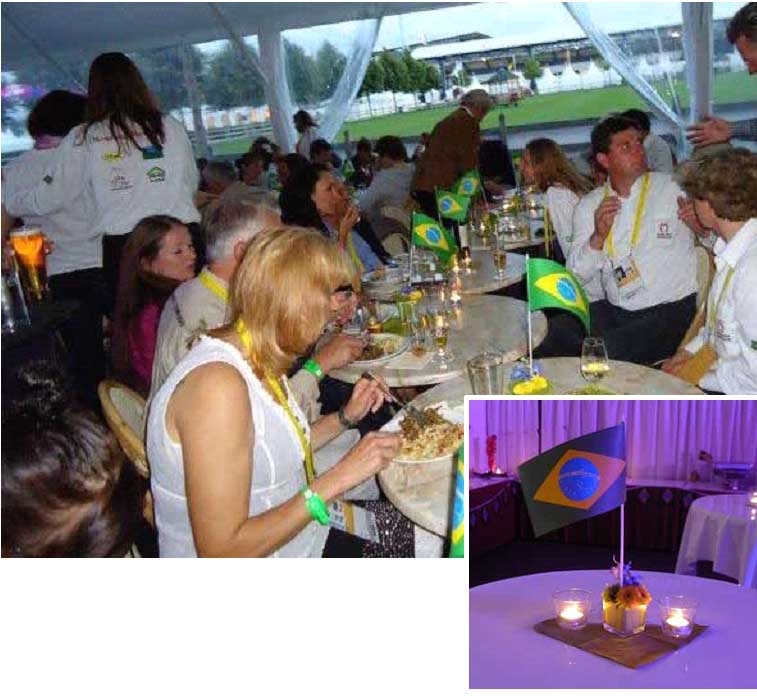 This made us very happy and after bringing back the horses and taking care of them we were celebrating a great party in the “Noite brasileira”! On Sunday 1st of July at 10.00 am all participants came to the drivers place of the CHIO com- petition ground. Dieter Mader, the EAMM sports director and some helpers marked an oval track on the drivers place. 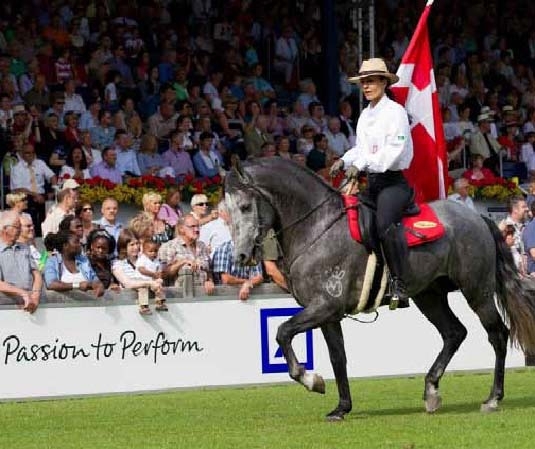 Verena Thielhorn, EAMM general manager made the announce- ments and the evaluation started right in time in 6 different groups: mares, geldings, stallions either in marcha batida or marcha picada. The judge Tiago de Resende Garcia was watching the participants carefully, made the placements and explained to the public why he was putting the horses in these orders. It was very exciting, interesting and we all were learning more about our horses. In the afternoon Dieter Mader and his helpers put the obstacles on the drivers place for the prova functional with a gait, a marked square to go backwards, slalom around pylons, galopp around barrels, two jumps and stop. The participants were free to leave one or the another obstacle aside with punish points but without risking anything. Participating, having fun and being part of it was more important than winning! Again this at- titude gave a special atmosphere of acceptance, tolerance and friendship to this event which is also the motto of the EAMM. 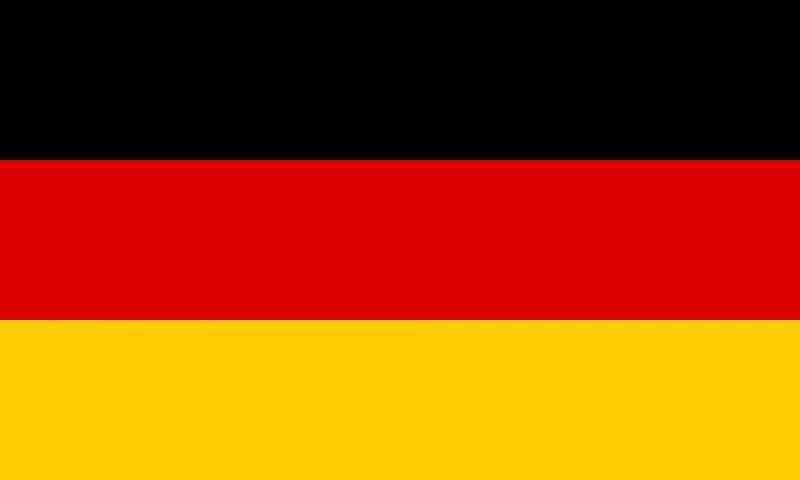 After the prova funcional Tiago de Resende Garcia announced the 5 best horses and riders and then all participants were honoured by Magdi Shaat, president of ABCCMM who came especially to Germany to be part of this important event in Euro- pe! All participants were happy and proud that they managed the “Sela de Ouro 2012” infront of such a big public! A spontainious meeting in an italian restaurant in the evening was a special end for this Mangalarga Marchador sports event and we were looking forward to the coming events: the ride to the market place and the CHIO opening ceremony! 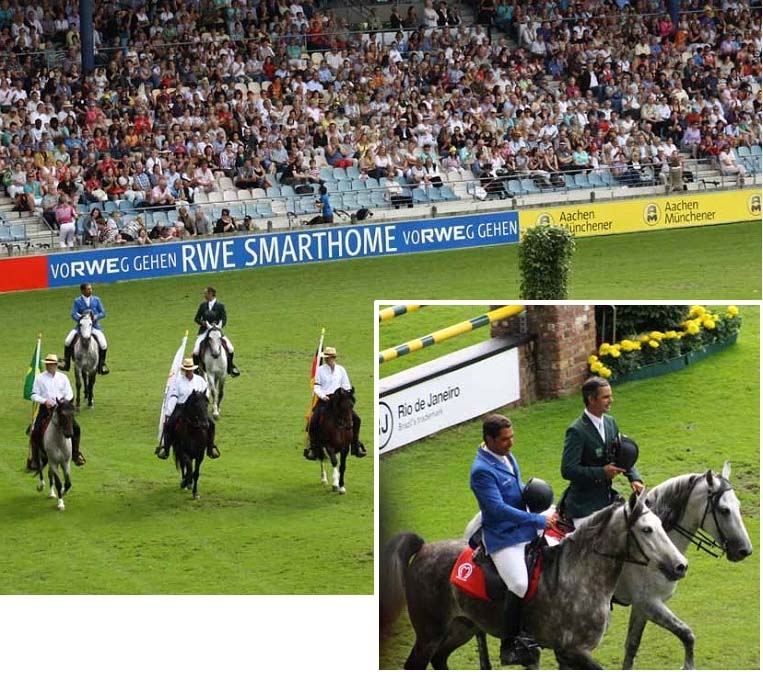 Chio Aachen.... one of the biggest horse festivals in the world! 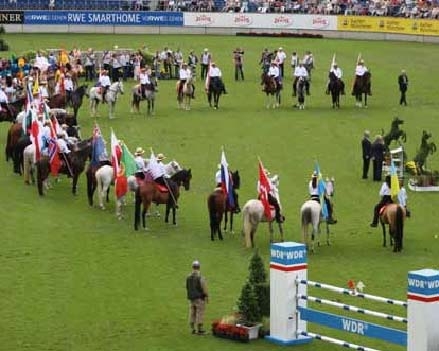 The participation of the Mangalarga Marchadores in the CHIO Aachen was one of the most important highlights for the promotion of this breed in Europe. 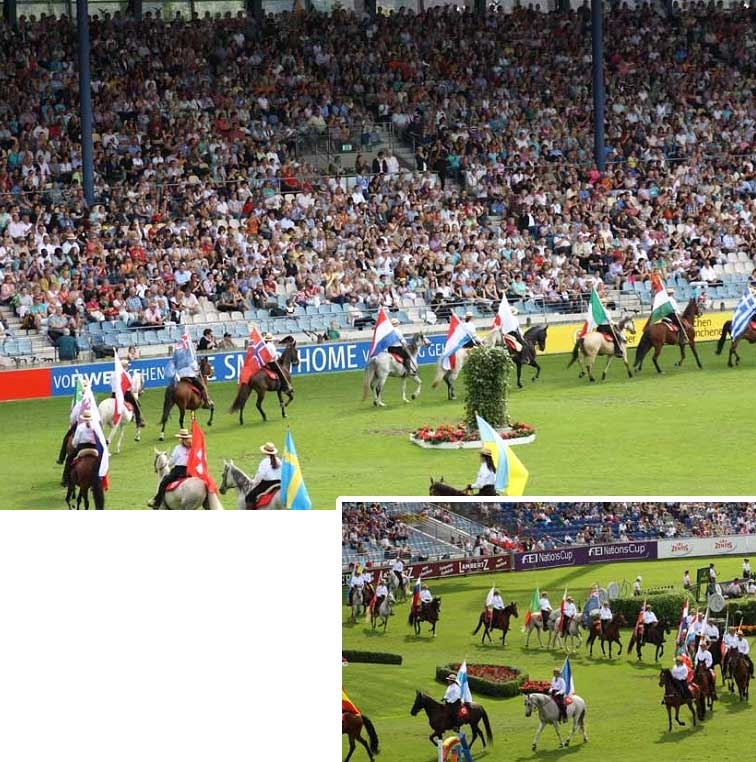 In the afternoon of July 2nd the Mangalarga Marchador riders met on the big grass field in front of the stables to gather for the ride to the market place in the old part of Aachen. 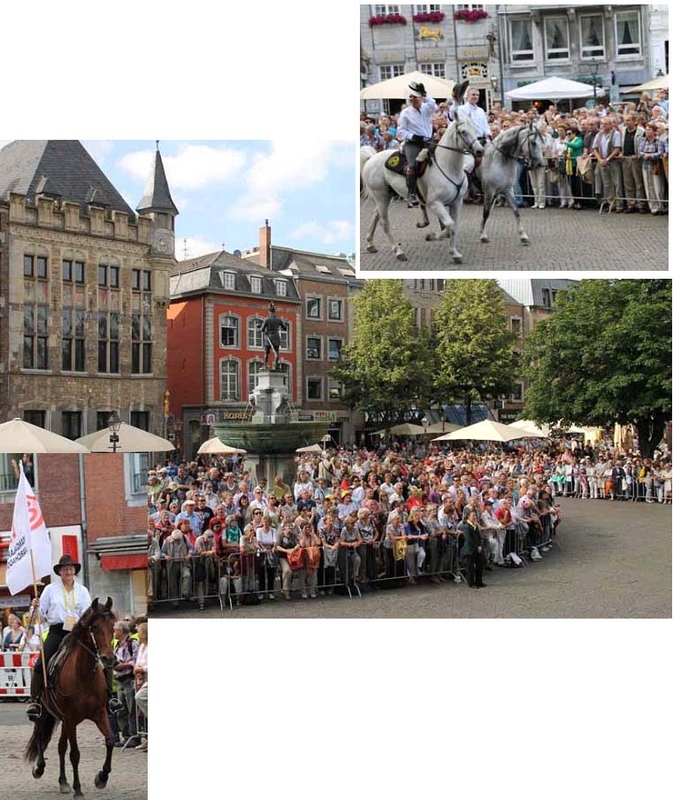 The first group in this procession were the “Aachen city riders” on warmblood horses. Then the carriage with Nelson and Rodrigo Pes- soa, “Doda” Miranda and the president of the organizing association Mr. Meulenberg. The carriage was followed by 45 Mangalarga Marchadores, members of the EAMM and eight brazilian guests riding (Sophia and Marcelo Baptista de Oliveira, Ricardo Barcelar Wuerkert, Tiago de Resende Garcia, Fernando Cardoso da Fonte, Silvio Amorim Fontes, Rogério Bivar Simonetti), and then the Criollo riders. The procession went through the old part of town and the copplestones made it not so easy for the horses but they could manage it. The road got narrow as the- re were thousands of people standing along the road watching the procession and giving applause. As the procession entered the market place they were surrounded by excited people and the Samba Dancers from Rio de Janei- ro. Mr. Meulenberg held a speech and the situation got very emotional. After a second show-up on the market place the procession went back to the stables. All the riders and participants were very excited and agreed that this was a special experience. 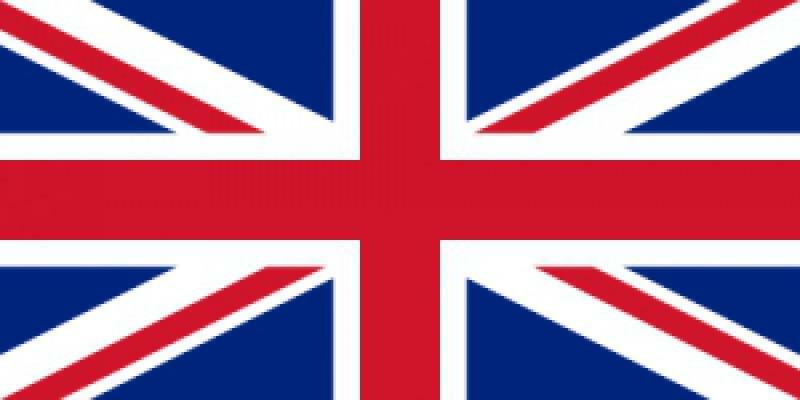 The next day 30 riders with their Mangalar- ga Marchadores met early in the morning to make a training with the flags of the nations for the opening ceremony in the afternoon. All the Mangalarga Marchadores had no problem with this new situation. Guided by three vitrine stallions the riders made a line, kept their distances and showed their hor- ses in a medium speed Marcha (Batida and Picada). At 17.00 o’clock the opening started and everybody was very nervous as the big arena was sold out with 50.000 spectators! After the Samba performance the Mangalarga Marchadores were announced and entered the arena: first part were the three vitrine stallions Ourofina ElFar, Apolo do Salto and Norte do Conforto who guided Rodrigo Pessoa on the vitrine stallion Urano de Maripá and “Doda” Miranda on Colora- do de Maripá. 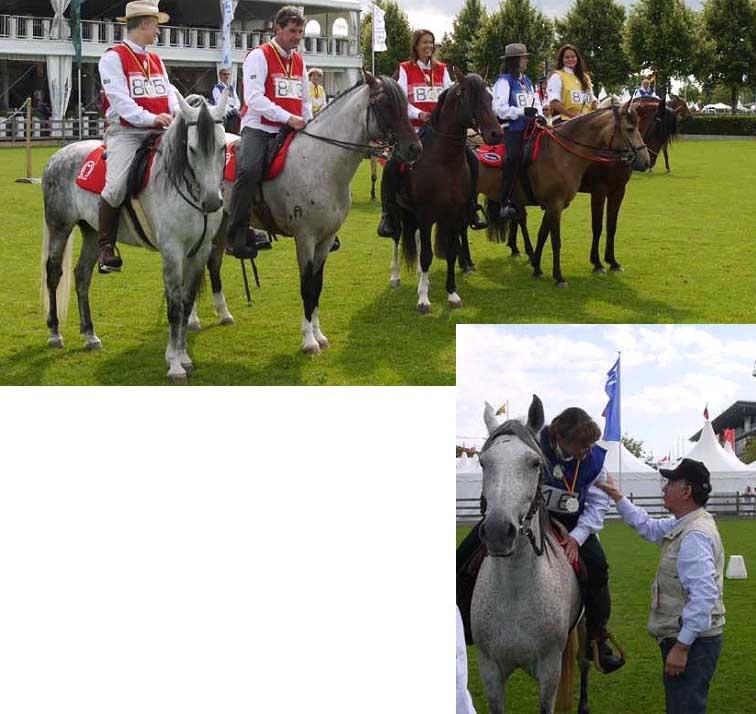 After a big round in the arena accompanied by the excitement of the spectators Rodrigo Pessoa and “Doda” Miranda left the arena and 30 Mangalarga Marchadores came in with their riders wearing the flags of the participating nations. This was a very exciting and emotional moment as the Mangalarga Marchadores made a great pic- ture! 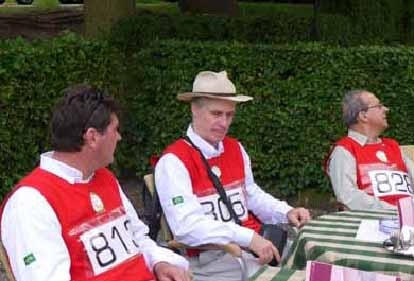 The stopped infront of the main tribune and Nelson Pessoa and Mr. Meulenberg held a speech. Then the Mangalarga Marchadores made one more round in Marcha and left the arena. It was spectacular and an unforgettable moment for all of us! 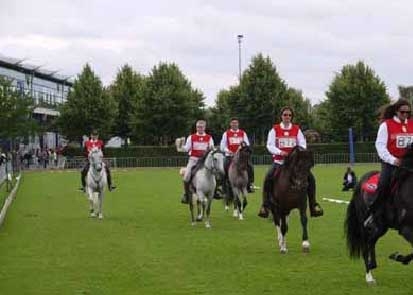 The vitrine stallions participated furthermore in the CHIO gala show “Horse & Symphonie” and the show program two times per day from July 1 until July 8, 2012. 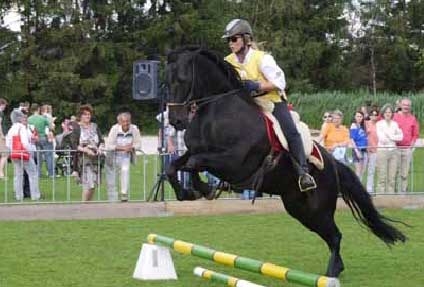 As the CHIO organizers saw the show of the vitrine stallions be- fore, they asked to present them two times per day in the show pro- gram of the CHIO. 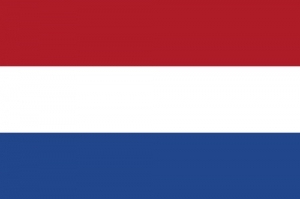 One time per day in the dressage arena (6.000 spectators) and one time per day in the jumping arena (50.000 spectators). They allways gained a big hand from the spectators and people started asking what breed that is, where they could be tested and came to the EAMM information stand in the CHIO village to talk to the people in the stand which were mainly Ali Selzer and Klaus Schwecke. In the CHIO gala show “Horse & Symphonie” the five vitrine stallions were the opening act toge- ther with the samba dancers and the Criollos. The onlasting applause showed the excitement of the people. The five vitrine stallions Ourofino Elfar, Norte do Conforto, Apolo do Salto, Patek und Urano de Maripá once again did an excellent job. These horses are afraid of nothing and they are so reliable and great representatives for the breed of Mangalarga Marchadores in Europe. The breed Mangalarga Marchador got a great attention and high reputation in Europe by this promotion. We are very thankful for the support of ABCCMM, the breeders of the vitrine stal- lions Magdi Shaat, Sophia and Marcelo Baptista de Oliveira, Antonio Santos Silva, Paulo Guil- herme Monteiro Lobato Ribeiro, the helpers and organizers of this event, the participants from Brazil, the participants from the EAMM and we are very, very thankfull for the wonderful horses as well!!!! 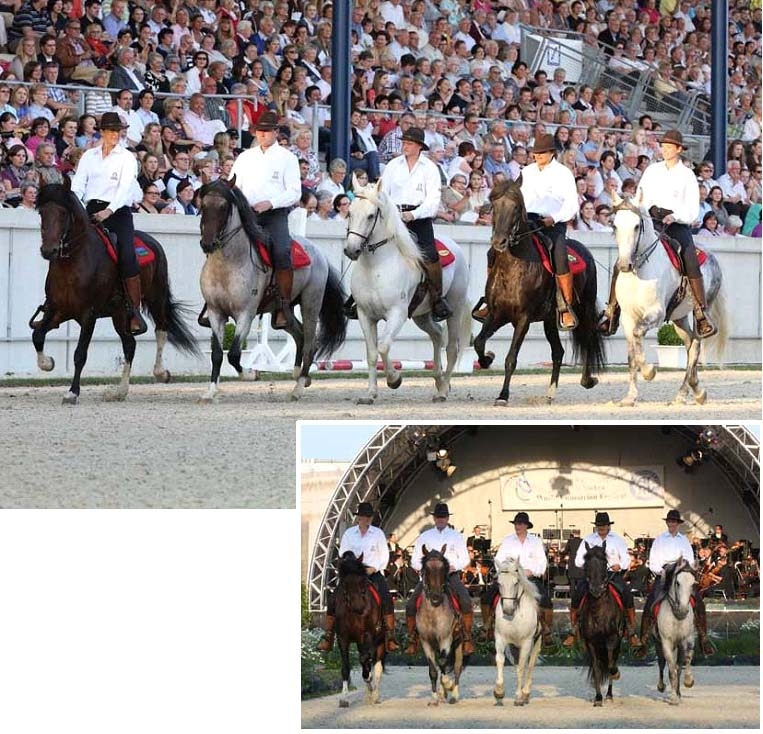 the five vitrine stallions were part of the opening act of the CHIO gala show „Horse & Symphonie“.